Discussion in 'Change Log' started by Drui, Feb 14, 2019. Actually, quick question, has the ability to douse things like Campfires, Ovens, Furnaces, Kilns, e.t.c been removed from the game? Medieval Engineers is only available through Steam. You can purchase Steam keys through third-party sites but Steam is the only distribution network we use. Didn't have time before to try all this new beautiful stuff out earlier, so I started a new game what I always do after major updates. I can say it all looks and functions excellent, allthough I'm obviously just in the beginning of the quests to do. Noticed one thing during the blueprint table quest where you build the small 4x4 wooden log cabin. When completing the building I noticed the shutters of the windows are all half way up the window height. Closing them fixes this and they jump into place and stay there. Not a biggie, but I thought maybe something to look into when there's time. All in all, great work guys. - Updated diagonal timbers. Now coming in all sizes! - Added mechanical stamp mill, it smashes your ores and stones for you! - Added searchbar to crafting screen, find your recipes more easily! - Re-implemented ctrl+click to queue 5 items at once in the crafting screen. - Addressed more roof issues, but more remain, so we'll fix some more tomorrow! - Fixed more crashes we collected from the logs over the weekend. - Resolved three more issues with saving, this should help solve the missing grids issue. - Fixed mechanical blocks not looping their animation correctly when it is stopped. - Searching for blueprints by name no longer has the spinner get stuck. - Deconstructing with a full inventory now drops the items on the ground nearby. - Barbarian should no longer push you around. - Training dummies can be picked up again. Why do you guys get all the cool stuff?? Makes SE Players feel like step children!! A search bar on the crafting screen doesn't really solve the problem with the UI. You still have to click and type every time you open a crafting station. You should have items at least in the top 3 slots, that are the most commonly used by that crafting station. Resource production should NOT be shuffled into finished products like chairs, tables, and dressers. They should be immediately the first 3 items you see. Timbers. Planks. Small stones. First page, first slots. Then you can go alphabetical. Or let us be able to pick favorite items to move them to the top. Alphabetical listing is THE WORST form of usability in terms of designing an interface. You don't want the user to go hunting through an alphabetical list. You want them to intuitively be able to grab what they want, from the first page, not search A-Z. I really like the UI in terms of looks, but it is not better than the old one in terms of functionality. It is far, far worse. Log Wall Slope, Left: Doesn't fit with its corresponding large tile roof piece (regular, flat, no corners). The 'right' version of the slope fits on one side of the roof, but the left piece gives a red invalid placement no matter what. Sorry, "Log Wall Slope, Right" does not fit with the large tile roof (flat). The left version works fine. Other way around. Also, plank timber supports can no longer fit under roofs, so there is a weird section that you can only fill with timbers. But as far as I remember, timbers do not actually give any structural integrity to a building? Are timbers/diagonal timbers in a structure still just for visual appeal or do they help to support the structure? Great update, thanks Deepflame and all devs. Space Engineers guys are hyping days before for bringing the ladder back, while Medieval Engineers gets a brand new mechanical block without even a screenshot for advertising. ME Faceebook page is posting ships and submarines instead. I really like the UI in terms of looks, but it is not better than the old one in terms of functionality. It is far, far worse. There seems to be some misunderstanding in the community about the purpose of the GUI changes. They weren't changed for functionality (which remains the same except for a few details), they were changed for intuitiveness for new players. They are a great success as well. In old usability studies, players had difficulty figuring out the multiple inventories and how to move items between them. 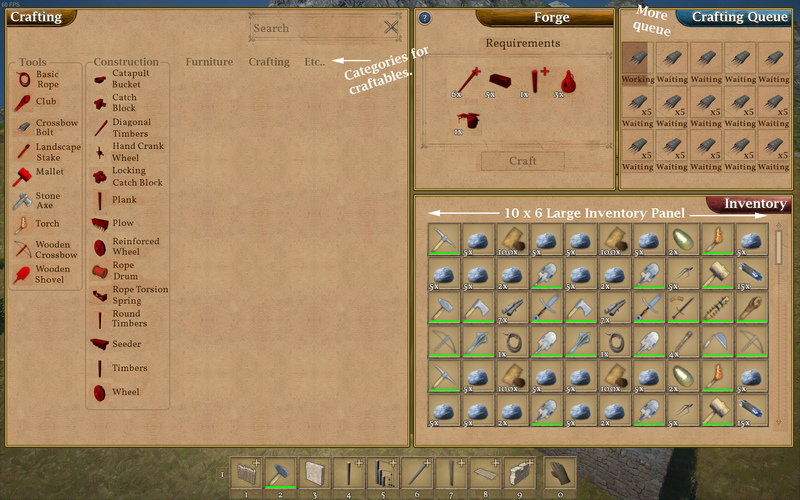 Players would try dragging the recipe icons to inventories. We saw instances where players rage-quit because they couldn't figure out crafting. Figuring it out was really difficult for anyone who hadn't played games with similar crafting systems. When we were prototyping the new crafting system we tested it with new gamers and a few non-gamers. They had no problem picking a recipe from a list and clicking craft. The "Take" buttons are pretty obvious. They helped most new players realize that they had to transfer finished items to their inventories. Those who missed that step immediately saw the "Take" buttons when they opened the crafting screen again. From a functionality and efficiency point of view, I agree there is room for some polish. Other than the queue, which does not support stacking, all other efficiency deficits can be recovered or improved with some tweaks. Yes, I agree there is a lot of improvement in the new UI. For example, I like that it has so much more room to breathe, things don't feel small and clustered in a corner and you had to hunt for the right icon. But as you said, the queue (and for me personally the production items being shuffled into finished goods), is something that can be remedied. It's definitely a better foundation to refine upon than the old UI. It's good that new players find it more intuitive. I find it so much cleaner but we gotta add some depth to it. Otherwise it's just pretty eye candy. Gotta toss some love to us veterans. Timbers and planks don't make themselves. Good idea, but I would prefer clickable tabs instead of several columns. You know, like the G-menu. Maybe even customizable, with tags and stuff, also like the G-menu. This would leave more room for modded items. If I understand right, they reduced the crafting queue length to avoid griefing. In my opinion, making the max. queue length configurable for server admins would make everyone happy, singleplayers and multiplayers. I wrote a long story of how this happened just now but it wasn't very interesting to read. To make the long story short, we had to satisfy some mandatory design requirements for intuitiveness. In the end, we simply weren't able to solve the design requirements without sacrificing some advanced functionality. We are still working to restore as much of that functionality as possible through other means. That's a nice suggestion if your goal is to get as much stuff on the screen as possible in a 16x10 aspect ratio. Unfortunately, it won't work in other aspect ratios and it breaks just about every guideline for GUI design that exists with the sole exception being that you maintained the improved flow from our design. I'm happy to discuss GUI design principals and requirements with you if you're interested, but this isn't the place. It's the return of the grunge! Once again, you went for that dead and decayed look on wood, even though the cinnamon maple you were using before looked gorgeous. You could have extended that to more wood pieces and it would have been fantastic. So lively. Maybe liven the contrasts, use some cider wood in order to make things less monotonous. Give it some contrast. Instead, now it's back to the grungy, 15 chip marks wood that no carpenter would ever consider an acceptable form of their work. If you hired a carpenter and he gave you wooden stairs that had chisel marks in 15 places where the work was abandoned, meaning never finished, you would never hire that guy again. Yet, this really bad carpenter constantly comes back to have their shoddy work put on display in ME. It literally gutted the soul out of my structures over night. Get samples from your local hardware store, for different kinds of wood - you never have this kind of shoddy marksmanship. People know how to craft wood and work with wood. Go through some of those and pick a palette that you can then use as a sample for your finished wood texture, in game. You can't have a game about engineering and not be able to have proper wood that people would have used. Where have you seen examples of wood that was this bad? Maybe on structures 500 years old, maybe the wood would look that bad. Today. But in its time, the wood, most certainly, did not look like that! You're right though, it wasn't the shortened crafting queue that was meant to avoid griefing, but the one-at-a-time-drag-and-dropping. Also, I did read your explanation. I must say, having played ME for almost four years now, I never had problems getting around the crafting menu (I was super happy when you actually introduced one back in the day!). Then again, I'm kind of a sandbox game enthusiast and therefore used to a plethora of crafting systems. I'm sure you guys will manage to improve the system so far in the near future to make everyone happy, new players and veterans (and the general UI design guidelines). Does anyone have the patchnotes to the last 2 hotfixes? They are absent from the front page. By the way, what's wrong with roofs? They don't form a clean V where they intersect, they create an X. The Inner Corner has a bouquet of every interconnecting roofpiece inside the inner corner, instead of cutting them off and remaining with one clean roof piece... Is this being worked on, or are these the way we should expect roofs to look from now on? Also, log wall right slope destroys tile roofs when placed on the outside. I got an update, changelog? - Barbarians can be picked up again. - Training dummies can push you around. They changed it up on ya!! Whisper in his ear "Hey baby, is that a studded club in your pants, or are you just happy to see me?" But seriously, picking up barbarian corpses would be cool. They're, like, everywhere. Need to tidy up my home. Also, a way to use the skulls would be nice, apart from putting them up a stick and/or building your entire stronghold out of them. Like grinding them to bone meal to fertilize your fields. Using them as a throwing weapon. Drinking mead out of them. After 0.7 update i can't build Large round floor (fresh install) . Can You fix it?